The nativity is not just a nice story. It may surprise you to know that in historical terms there’s more documented eveidence for the existence of Jesus than Julius Caesar, curious I know. So given that Jesus existed, he had to be born right ? There are many parts to the story of the nativity, Shepherds, Angels, Wise men and of course the star. Well that last bit must be made up surely? Well … maybe not ! However, and there’s always a ‘however’ isn’t there, the problem lies in that figure of 70 days. Astrophysical theory provides a link between how bright a supernova is and how long it takes to fade and for the “Christmas supernova” to have faded so quickly, the original explosion would have been a bit of a damp squib. However (there it is again), what may be the best theory yet was put forward in 1999 by Mark Kidger, who argued for the Star being a nova rather than a supernova. A nova is a kind of stellar explosion triggered when hydrogen is dragged from one star on to another orbiting around it. 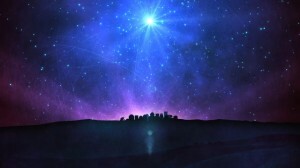 The most convincing explanation is the one that does the best job of explaining the Star’s sudden appearance, location and brightness and this last ‘nova theory’ fits in well with both the Gospel accounts and known physics. In addition it is also backed up by Chinese astronomical records, which seem to point to a nova explosion in the constellation Aquila in mid-March, 5 BC. So there you have it not just a “nice story” after all. ⇒ The Magi – a new revelation ? ⇒ Was Jesus really born on the 25th December?